Michael Rosenfeld Gallery presents William T. Williams: 1970 in Booth D10 with an exhibition that focusses on the year 1970 with a selection of paintings and never-before-exhibited works on paper. William T. Williams (b.1942) exploded into the New York art world in 1968 after graduating from Yale University (MFA). Paintings from his first mature series were exhibited at Reese Palley Gallery, reviewed in the New York Times, and acquired by some of the most notable collectors of the time and institutions, including The Museum of Modern Art, The Studio Museum in Harlem, and Yale University Art Gallery. 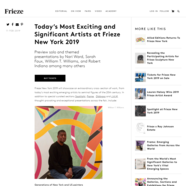 Recently, while relocating his studio practice from New York City to Connecticut, Williams discovered approximately eighteen works on paper created during the same period as these seminal paintings. Michael Rosenfeld Gallery will present these works along side two major paintings. Michael Rosenfeld Gallery is the exclusive representative of William T. Williams (b.1942) and the artist will be present in the booth on Sunday, May 5.